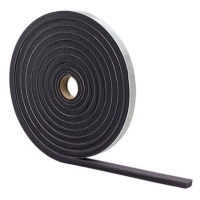 The Macklanburg-Duncan Low Density Open Cell Foam Tape helps provide more control over home temperatures by creating a tight seal to prevent cold air from entering the home during winter, and heated air from entering during summer. The tape is a resilient self-sticking foam tape that presses flat to form the seal. It protects against the unwanted exchange of air as well as moisture and dust around windows.